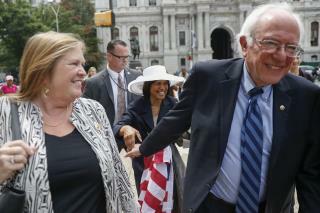 (Newser) – Bernie and Jane Sanders have lawyered up in connection to an ongoing FBI bank fraud investigation into the couple, CBS News reports. The investigation regards a 2010 loan application Jane Sanders submitted while president of the now-closed Burlington College. Sanders was seeking $10 million to purchase land to expand the college. According to Newsweek, she allegedly fudged college donor levels on the application: Two donors were listed as pledging more than they actually had and a third was listed as willing to donate in the near future despite specifying her donation wouldn't be made until after she died. Meanwhile, Bernie Sanders is alleged to have used his office to pressure the bank into approving the loan, Politico reports. Bernie "Tootsie Pops" Sanders. During his convention speech, it took him 258 lip-licks to get to the center of his farce. Democrats will be democrats. Amazingly Bernie was on Meet The Depressed this weekend and not once did Up-Chuck Todd mention this issue or ask him about it. Sometimes fake news comes in the form of what doesn't get reported by the left media. It's so hilarious that rightwingers instantly believe vague, obviously trumped up charges against Bernie, but won't admit that donald can ever do anything wrong. It sounds like these so-called fraud allegations have basically no merit, especially with respect to Bernie. In the best case, they could slap his wife's hand, but vague accusations of "pressuring" are not prosecutable. If so, then Trump could have been prosecuted 1000 times over. He pressures everyone all the time using his office. And I'm sure that Trump has lied on more loan paperwork in one day than the rest of America put together.